The air quality within your home can affect many aspects of your health, which is why it is important to understand the quality of what you breathe. Awair aims to do just that while looking striking in the process. 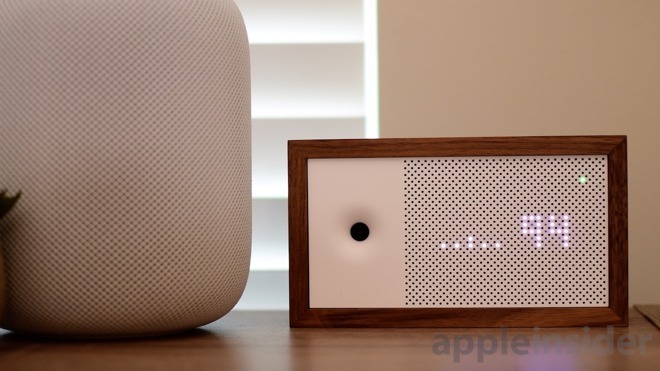 The second-generation Awair is an air quality sensor that excels in two areas —it looks better than most, and it works better than most. Even with lack of HomeKit, it easily earns a spot on our shelf. Unlike most other smart home gear, Awair puts a priority on looks. It isn't meant to hide in the background, but instead stand out and be noticed. The exterior is a nice American walnut frame, which fits easily into most modern home decors. If you don't want to always view metrics on the screen, it can display a clock. A pair of buttons and the power port are on the back. An air intake hole and a series of perforations are are on the front. Awair is powered through USB-C, which is something we were quite happy about. USB-C is the way the industry is heading, if perhaps a bit slower than Apple might like, so it is only appropriate that any new product opts for that over micro USB. Bonus points for this. Behind some of those perforations are LEDs, used to make this into a display. By default, a series of bars representing the various measurements are shown with the overall score in the top right-hand corner. Tapping the top button on the back allows you to cycle through individual metrics or to display the time. There are five primary measurements that the Awair can sample: Fine dust, CO2, humidity, temperature, and volatile organic compounds (VOC). The Awair explains what each of these are, what they can cause, and how to fix them if they hit unhealthy levels. Awair's software is also proactive in giving you tips on these metrics, a difference that distinguishes it from other air sensors. If enabled, Awair will also send you alerts when your metrics are awry and when they get back into spec, whether at home or on the go. To get these measurements, users can glance at the integrated display, view them in the Awair app. or query Google Assistant, Amazon Alexa, or Nest. The in-app experience is nice, with a simple and straightforward design that looks great. Right when you launch it you are brought to the overall score. The Awair score is a summary of your air quality in one single value. Below it is a bar graph of each of the five individual measurements you can easily view. Additional tabs have tips, trends, integrations, and notifications. In our time testing, it has been really helpful in understanding our air quality. For us, the biggest detractor was the lack of HomeKit support. There is support for Amazon Alexa and Google Assistant, but Apple's Home app is still not supported here. This is something we'd like to see change in the future. 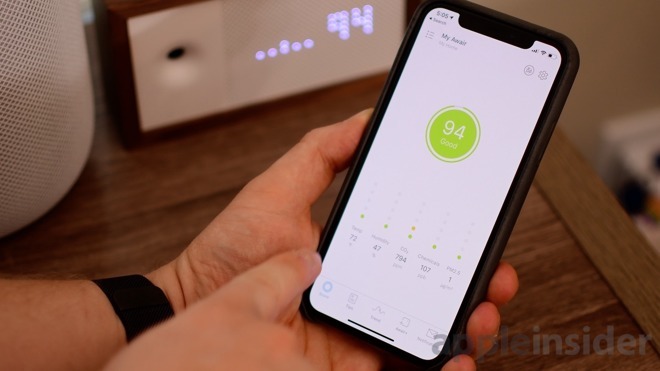 With HomeKit, we'd be able to enable an air purifier when the quality drops down and turn if off when it goes to normal. We'd be able to ramp up the dehumidifier when the humidity levels get too high. Unfortunately, we can't do that as it stands. Other sensors like the Eve Room are capable of doing this at a lower price, but they don't look quite as nice and are limited in other regards. Air isn't something you can easily see, which makes it difficult to spend some substantial money for something that helps you "optimize" it. We've tested out a whole host of different air quality sensors, and they just didn't seem to work quite as well as Awair did, nor did they report quite as many metrics. Let alone let us know how to correct them. This year, pollutants in the air have been high, with allergies really getting to people, and even their pets. Awair let us know that VOC was too hight for comfort, and PM2.5 was elevated as well, that other sensors weren't warning us about. We made a few changes and after we did, we saw a noticeable difference in us, as well as our dogs' health. It's not lost on me that I could have just made those the changes because of the allergies, and not require the Awair to scream about it. What I like is that Awair does things proactively, alerting me to make corrections before they become an issue, and not after we get a biological effect from the pollen. 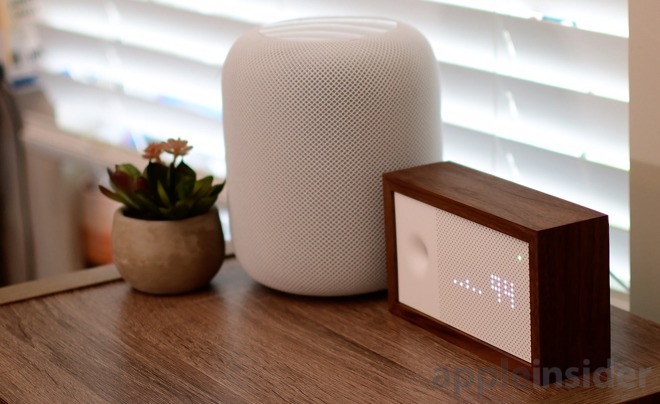 Awair is all around excellent, with the only mark against it being the lack of HomeKit support. 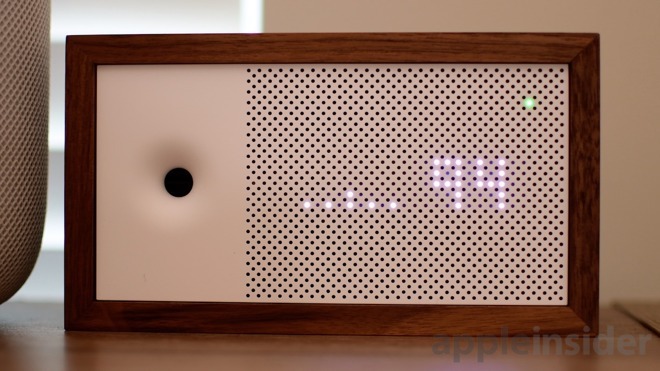 Awair promises to help you understand what is in the air you breathe, and it does just that. Air quality has the potential to improve allergies, asthma, focus, sleep, skin health and your overall health. 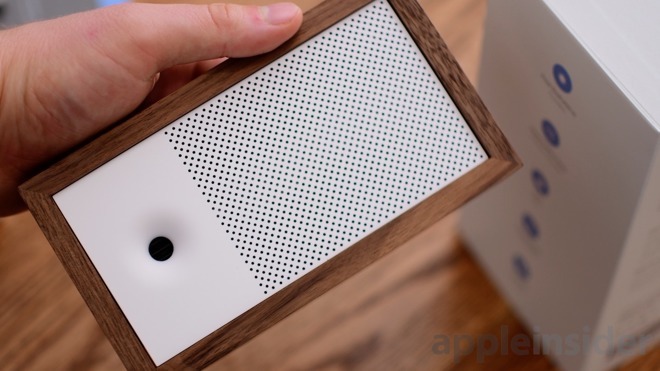 To pick up the second-generation Awair air quality sensor, you can find it on Amazon for $198. It is a bit more than other air quality sensors, but it is made out of higher quality materials, provides better insights and actionable tips, and measures better, which we think makes it worth it.